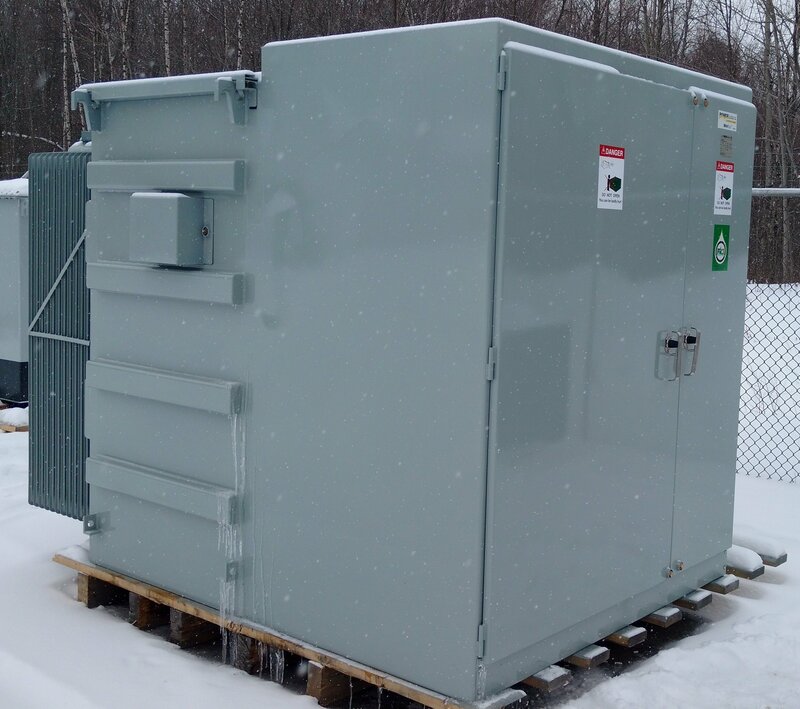 Power Systems has developed a new concept in unit substation design which brings together the unique benefits of oil/liquid filled padmount transformers as defined by the CSA specification C227.4, and SF6 switching technology using the Arc-Whipper© three position switch. Compact size is only slightly larger than a padmount transformer. 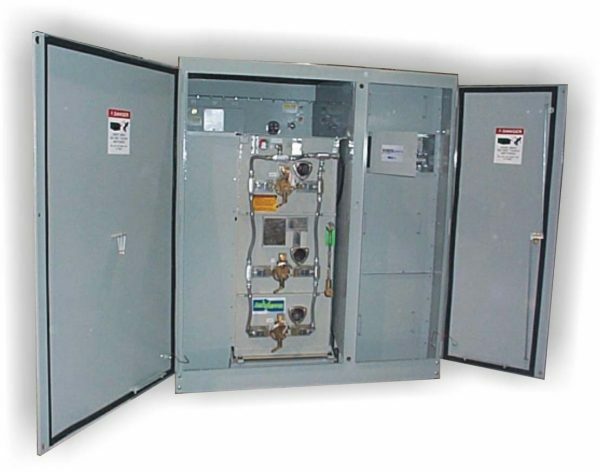 This unit can house up to 3 load break primary disconnects, fusing, secondary metering and distribution. 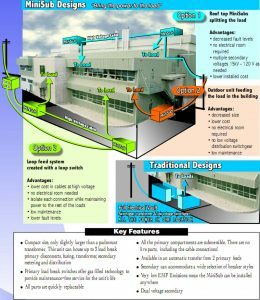 Primary load break switches offer gas filled technology to provide maintenance-free service for the life of the unit. Interconnecting components of the switching to the transformer allow the switches to be unplugged from the transformer in minutes. All the primary compartments are submersible. There are no live parts, including the cable connections! Available in an automatic transfer from 2 primary feeds. Available with Measurement Canada approved metering. 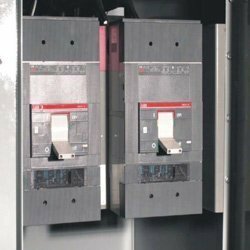 Secondary can accommodate a wide range of breaker arrangements. Designed to meet the requirements of non-utility operated equipment. Power Systems has chosen to use the basic padmount transformer design which is a proven technology since the 1970’s. 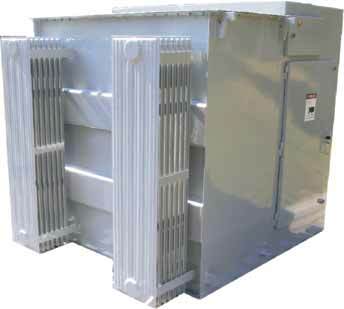 This transformer design offers an economic and reliable package and making the overall appearance very acceptable. All transformers used with the Power Systems MiniSub are built to the CSA C227.4 M1978 specification , and conforms to CSA C802 specification for efficiency and losses. Transformer sizes are available from 150 KVA up to 3000 KVA in 5 to 34.5 kV range. This gives a very broad range of application for the MiniSub. Transformers are available in standard transformer oil (ONAN), or R-Temp oil(LNAN) for installation in non fire rated environments. 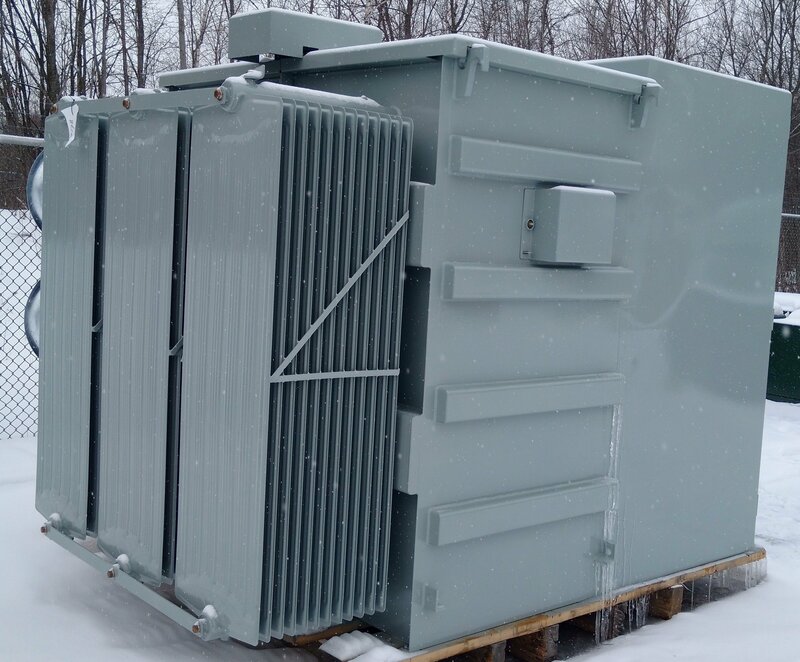 Our transformer designs are also built to meet ANSI/IEEE C57.92-1981 guide for loading of oil filled transformers 55°C or 65°C rise, which allows for up to 30% overload. Tamperproof design with secure hinges and lockable handle. All Power Systems MiniSub's are equipped with a system of Bay-O-Net® and current limiting fuse assemblies in a two fuse protection scheme, with the current limiting fuse as the backup. In this arrangement, secondary faults and overload currents are cleared by the Bay-O-Net® fuse. High level faults caused by internal failure is cleared by the CL fuse. The two fuses are connected in series. If a CL fuse is not requred, an isolation link is provided. Access to the Bay-O-Net® fuse is restricted by a metal cover over the fuse holders which is key interlocked with the ArcWhipper switch, to be sure that power is in the off position prior to assessing the fuses. NOTE: The application of internal fusing in voltages at 25kV and above can only be done in a wye primary connected design. The load on the transformer can not exceed more than 50% delta connected secondary loads. Certain condition of ferrule resonance can exist at these voltages and the application of lightning arrestors should be considered. Visible break conforms to widely accepted operating safety practice, giving clear visual confirmation of contact position of ALL THREE PHASES through the viewing windows in the tank. 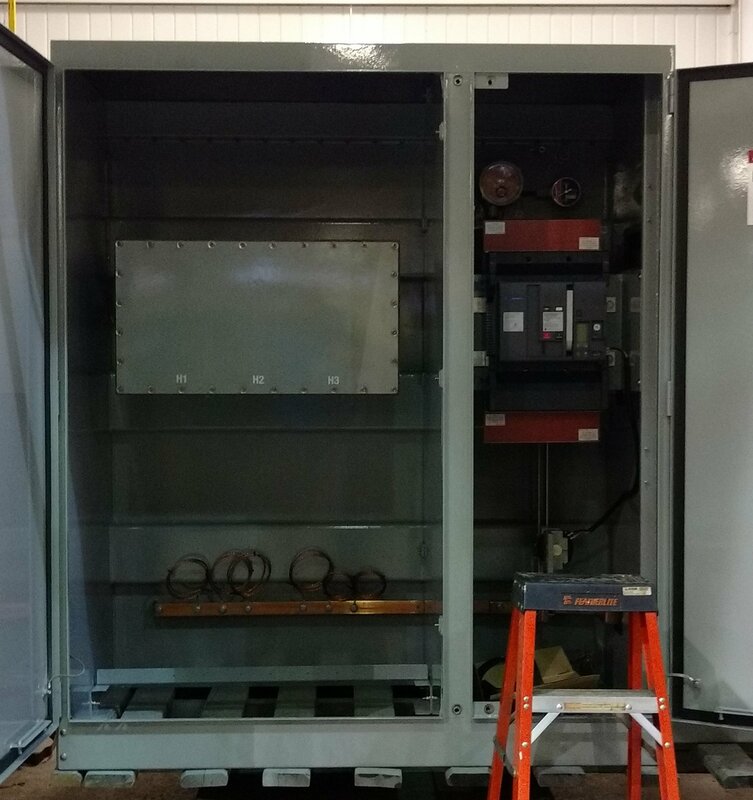 The large open gap allows field voltage testing without cable removal. Arc Whipper® SF6 loadbreak switches are ruggedly constructed, incorporate proven design and are rated/tested in accordance with ANSI standards C37.71-1984 and C37.72-1987 for long life with minimal maintenance. Switch contacts are equipped with very high speed auxiliary arcing contacts to quickly interrupt in ¼ to ½ cycle, leaving main contact surfaces undamaged by arcing. The arcing contact allows main contacts to be designed for high continuous, fault close and momentary current performance. Switches are factory filled with non-toxic, non-flammable, high dielectric SF6 gas insulation. SF6 quality and stability are maintained by use of totally sealed tank construction, an internal purifying absorbent and the extremely fast Arc Whipper® interrupter. A color coded, field replaceable pressure gauge and self-sealing fill valve allow monitoring and addition of SF6 as necessary. provided. Current carrying parts are high conductivity electrolytic grade copper with plating, locking fasteners, and torque wrench assembly to assure permanent low resistance connections. Moving contacts are self-aligning, self cleaning (wiping type) and designed to increase contact pressure with increasing currents. Contact assemblies are supported by high strength, molded glass polyester insulation with flex connectors at critical locations to prevent stressing and misaligning due to high current or mechanical forces. ANSI C37.71-1984 Standard for Subsurface Load Interrupting Switches. ANSI C37.72-1987 Standard for Padmounted Load Interrupting Switches. ANSI/IEEE 386 Standard for Separable Connectors and Bushings. IEC 265 International Standards for Load Interrupting Switches. 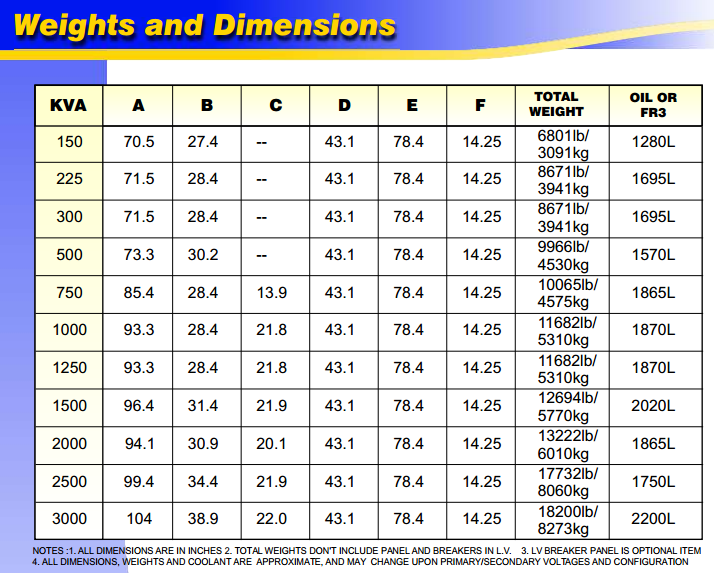 ASTM D-2472 Specification for Commercial Type Electrical Grade SF6. ANSI C57.12.28 Standard for Padmount Enclosures. 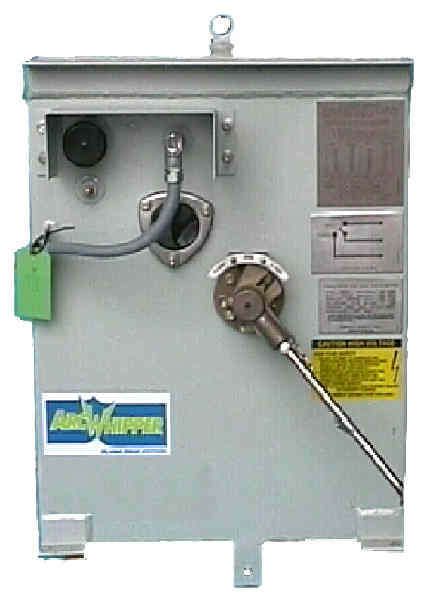 Arc Whipper® SF6 loadbreak switches are completely submersible, fully deadfront, and corrosion resistant for application in the harshest conditions including areas subject to flooding, severe contamination, rodents and snakes, blowing snow/dust, sea coasts, high altitude, and even Division 2 hazardous locations. Non-toxic, non-flammable SF6 insulation permits installation indoors or outdoors in high traffic areas. Compact size and reduced weight provide solutions where overall space is important such as in high-rise buildings, front lot lines and in small vaults. Arc Whipper® SF6 load break switches are equipped with external handles for manual operation as standard. The handle can be padlocked in all switch positions and has an anti-reversing feature for additional safety. Interlocks can be provided as may be required by local practice and for increased safety. In addition, remote/SCADA and fully automatic operators are available for increased levels of control and system automation. These motor operators attach to the switch handle and may be easily disconnected for manual operation. The handles are removable and can be attached to the switch operating shaft through an arc of 360 degrees in 45 degree increments for maximum mechanical advantage during operation or may be removed and stored on the padlockable hanger bracket when not in use. Rotating the handle toward the desired position causes quick make/break, spring operated contact movement independent of the operating handle movement. Latches prevent contact blow off and provide positive position indication. Additional features include: padlock provisions in all positions, bushing oriented line diagram and instructions. Three position switches are equipped with anti-pass through provisions to prevent inadvertent operation to the third position. coordinate proper system operation. Keylocks are mounted on the specified switched ways with locking provided for the required position. The MiniSub is ideal for maintaining power to critical loads such as hospitals, airports, shopping centers, and industrial facilities. Upon loss of preferred primary feeder voltage, the load is automatically transferred to an alternate source. Optional automatic retransfer, overcurrent detection and fault isolation provide additional system flexibility. Units include fast acting 120 VAC motor operators attached to the switch operating handles. Voltage sensing is done through a set of elbow mounted detectors and relay combination which supply data to the full function automatic control with self-contained 120 VAC/24VDC control power source. All items are factory assembled, wired, adjusted, and tested for simplified installation and operation. Each switched way is equipped with a viewing window for clear, visual confirmation and assurance of contact position of ALL PHASES. Conforms to local code and operation practices which require visible break and (where equipped) visible grounding during system operation, maintenance, repair, or testing. Eliminate the possibility of interrupting currents beyond the capability of the switch by preventing immediate operation after closing on a fault. A latch on the operating handle must be reset prior to subsequent operation allowing upstream circuit protection time to clear the fault. ANSI/IEEE standard 386 defines the specific interfaces dimensions that 200 and 600 amp, elbows, inserts and equipment bushings must conform to insure interchangeability. The 200 amp load break, and 600 amp non load break connectors provide a convenient and safe way to connect all primary cables. With the use of a Raychem PILC kit, lead cables can be connected using the same style. 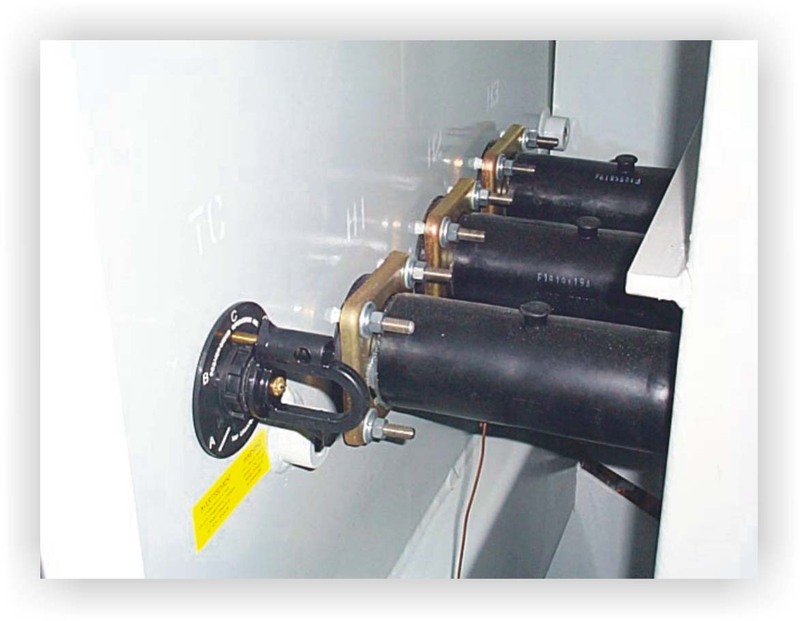 While the cables and terminations are barriered from access, the elbow test point offers an additional security and safety, as well as a voltage reference for automatic or SCADA type operations This termination provides a deadfront waterproof connection. There is a wide variety of accessories available in the secondary compartment. This is specific to each project and designer’s needs. This unique connection between the SF6 switch and the transformer allows the switch(s) to be plugged in for a water tight connection. This feature allows the switch to be removed in the field for service, if required. At transformer can be replaced with this method in a few hours. This connection maintains the submersible criteria of the MiniSub unit.